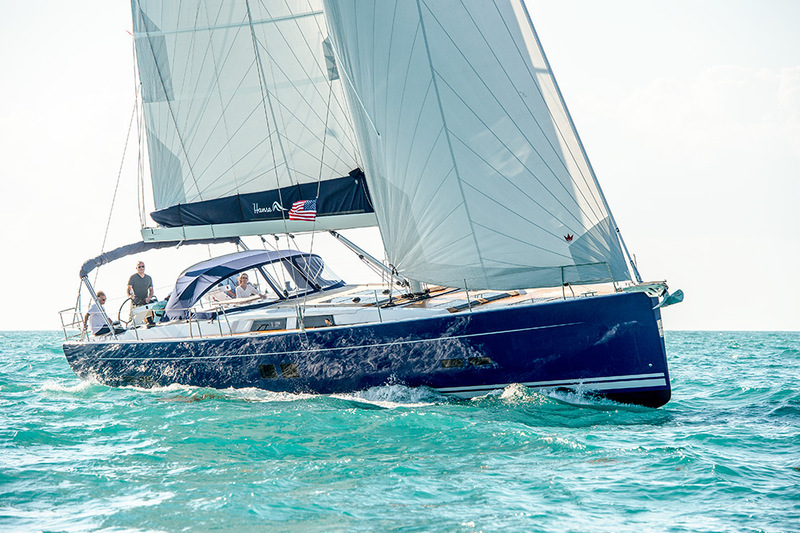 Designed by the prolific firm of Judel/Vrolijk & Co., the Hanse 575 makes a vivid first impression. It’s huge. And I am not just talking about LOA. It’s big in every way, and like all modern designs the ends are plumb to maximize waterline. The freeboard is distinctively high and accentuated by a handsome near-flush deck. The generous beam is carried nearly all the way aft to an ingenious fold-down transom. It seems a bit formidable until you step aboard and realize that the sail controls, sightlines and systems are brilliantly designed for easy handling. We had a breezy morning in Miami for the boat test and elected to take the boat out to sea instead of hovering in the protected waters of Biscayne Bay. I was immediately impressed with how the 575 powered through the considerable chop churned up in Government Cut. The 110-horsepower Volvo had no problem pushing the boat along at 8 knots at 2,300 rpm, and it was quiet and vibration free. Clear of the breakwalls we hoisted the main, unfurled the self-tacking jib and sped off on a tight reach. We were a bit overpowered in the 25-knot easterly and kicked up sheets of spray, but the 575 felt rock solid in the water. The lines run aft under the deck from the mast collar to a bank of clutches forward of the winches. The 575 is built to Germanischer Lloyds SE standards for oceangoing yachts. The hull and deck are balsa cored with a mix of polyester and vinylester resins. The primary bulkheads are laminated to the deck as well as the hull and combine with a composite grid to provide structural integrity and overall rigidity. The keel, a T-bulb, is externally mounted with stainless fasteners. The standard draft is 9 feet 4 inches and a shoal 7-foot, 4-inch keel is an option. The 575 cockpit is voluminous and very well designed. Twin composite wheels are widely spaced for steering from either the high or the low side and the walkway between provides unfettered access to the stern. Speaking of the stern, it hydraulically folds down to form a large swim platform and reveals a dinghy garage housed under the cockpit. It is specifically designed for a Williams Jet Drive RIB but will also accommodate other similarly sized RIBs. A folding fiberglass passerelle for Mediterranean mooring is standard. Twin teak tables with robust stainless bases are ideal for cockpit dining and offer leg support when heeled. The tables can also be retracted to form a giant sunbathing area. Clever waterproof storage boxes for cell phones, keys and sunglasses are on either side of the companionway and there are line lockers for tails at each helm station. Each steering pedestal is equipped with a compass and an optional navigational system. The engine controls are to starboard. The view forward is quite impressive as the low-profile deck offers uncluttered sightlines. While some cruisers prefer center-cockpit designs for various reasons, nothing beats the sensation of driving a large, aft cockpit thoroughbred in a fresh breeze. You can see everything—the sails, the deck, the horizon—you are not sequestered under the boom and guarded by a dodger. 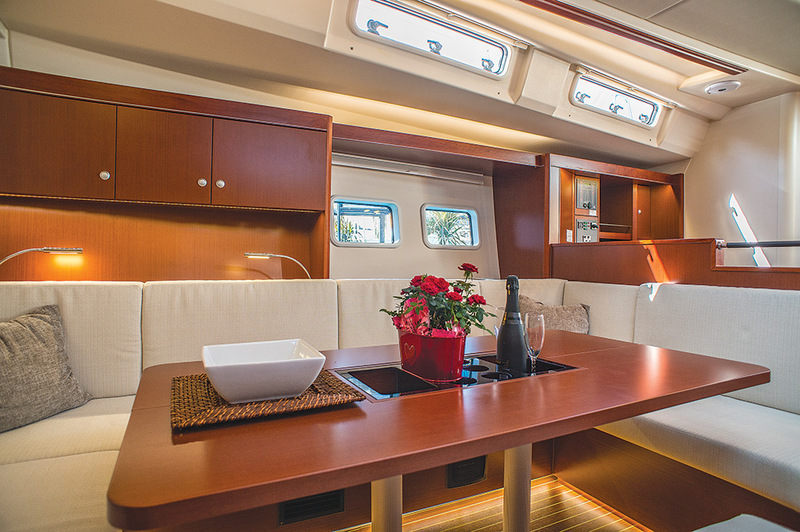 The abundance of headroom and portlights up the 575's livability factor. Multiple layouts offer owners a chance to create their perfect liveaboard home. The electric primary winches are just outboard of the helm stations and easily reached by the helmsperson. A bevy of lines that run aft under the deck from the mast collar are controlled through a bank of clutches forward of the winches. The design is clean and efficient but it takes a bit of sorting out at first. Once you have the lay of the lines, you realize that handling the 575 is simple. With a self-tacking jib, turning the boat is a matter of trimming main and turning the wheel. And with the main halyard and reefing lines led to the helm station, even reefing is a one-person operation with the electric winches doing all the heavy lifting. 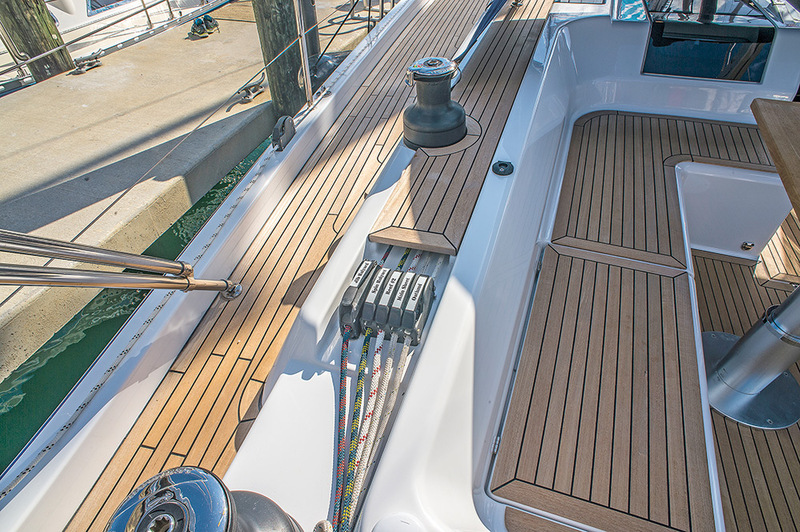 The deck of our test boat was covered in teak which is not only beautiful but offers sure footing that fiberglass nonskid has trouble matching. Coupled with a molded bulwark and well-supported lifelines, the essentially flat deck is easy to navigate. A few additional handrails would be welcome however. A single anchor roller is standard along with a vertical windlass. There’s a tack point for the asymmetrical sail on the anchor platform. All deck hatches are flush mounted. 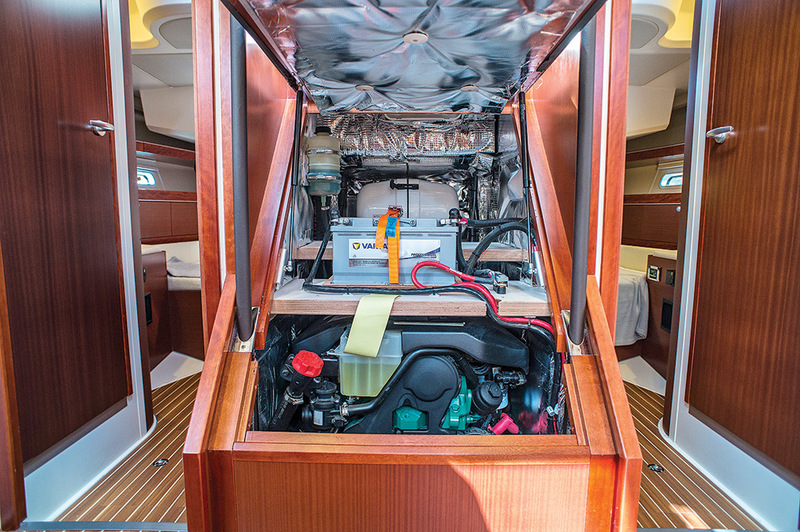 The access to the 110-horsepower Volvo engine, the generator and the batteries is located under the companionway. The fractional triple-spreader rig has outboard chainplates, an interesting design feature that reduces the potential for eventual crevice corrosion. They also limit tight sheeting angles with standard genoas. However, the 575 is rigged for a self-tacking jib that sheets on a curved track and runs aft under deck. A short headsail track used when flying the 105% genoa is well inboard of the chainplates with a fair sheet lead. The standard full-batten mainsail includes lazy jacks and a lazy bag. The main, with more than 900 square feet of sail area, is the heart of the drive system. The mainsheet is mounted near the center of the boom and uses a triangular block arrangement in lieu of a traveler.